Jewish scholars are generally assumed to have played an important role in the medieval transmission of science. It is in part through translations into Hebrew that the Christian world learned of medi- eval Arabic scientific works. This manuscript was most probably copied by the scribe of a much larger miscellany with similar content, which was once part of the Sassoon Collection of London (Sassoon 823; also see cat. no. 97). The name of the scribe of both manuscripts, Moses, is known because he emphasized it with decorations in the larger manuscript. The Sassoon manuscript is now part of the Schoenberg Collection at the University of Pennsylvania in Philadelphia (ljs 057). Another copy of part of the codex is housed in the Österreichische Nationalbibliothek in Vienna (MS. Heb 132). 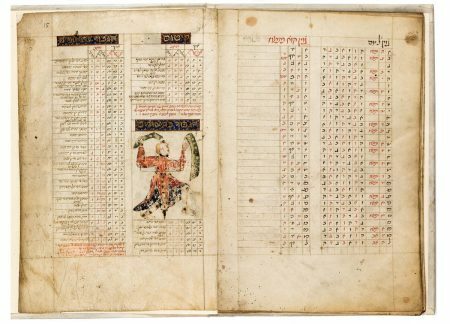 (2–4) Astrological works of Abraham ibn Ezra (1089–ca. 1164): a fragment of Reshit Hokhmah (Beginning of Wisdom), the larger part of Mishpetei ha-Mazzalot (Judgments of the Constellations), and the larger part of Sefer ha-Olam (Book of the World). (5) Sefer ha-Mivharim le-Batlamyus (Ptolemy’s Book of Elections, i.e. his Almagest). In 1988 Y. Tzvi Langermann, in an article on the Philadelphia codex, claimed in regard to the latter text that “to the best of my knowledge, this is an unicum,” but the Braginsky manuscript contains the text as well. Fischer 1988; Sassoon 1932, pp. 1041–1043, Sotheby’s Tel Aviv 1994, lot 211; Schwarz 1925, pp. 208–211, no. 185.